Not to far from where Sherry's Frozen Yogurt came and went is the new Dong Chu East District branch of Yofroyo, tucked a couple alleys away from the corner of Dun Hua and Zhong Xiao (and the stinky tofu vendor). Once you get in the right alley, it's not too hard to spot with its colorful logo beckoning you to see what it is. The space is not huge, but there's a good amount of seating and tables on the side as well as tucked in the back. While stylish and kind of mod, the low backed chairs got a little uncomfortable for me while we were lounging and eating. I was pleasantly surprised to see that prices were not too much more than its original Shida location and a small size wasn't skimped on. I think this is definitely important for picky customers who have a lot of options to beat the heat. It's almost half the price of the nearby Hielo and Yogurt Art. After browsing the choices, I still stuck to my usual small Tokyo Reverie (NT$65) with green tea frozen yogurt, red bean, green tea mochi and chewy clear konjac. 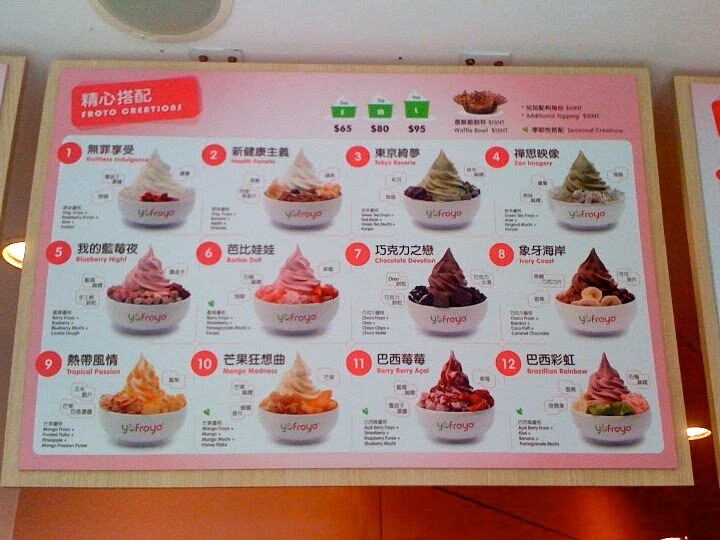 Other frozen yogurt flavors include Mango, Chocolate, Berry, Lychee and the new Acai Berry. I was planning to share one with my friends, but we were too tempted by the "Buy one, get one free" grand opening promo to resist (which runs until 5/16). Two of my friends chose to make their own combos with the original tart flavor and two toppings, which is easy to do at an additional NT$10 per topping. I love the new colorful sporks too, though they are quite Yogurtland-ish. I usually save and reuse my Yogurtland spoons and might quickly collect a set of Yofroyo ones soon. Opening this branch almost a year after opening the original in the Shida night market, Yofroyo is a welcome addition to this neighborhood. Especially when you're looking for relief from this crazy Taipei humidity and heat! No. 9, Lane 59, Shida Rd. 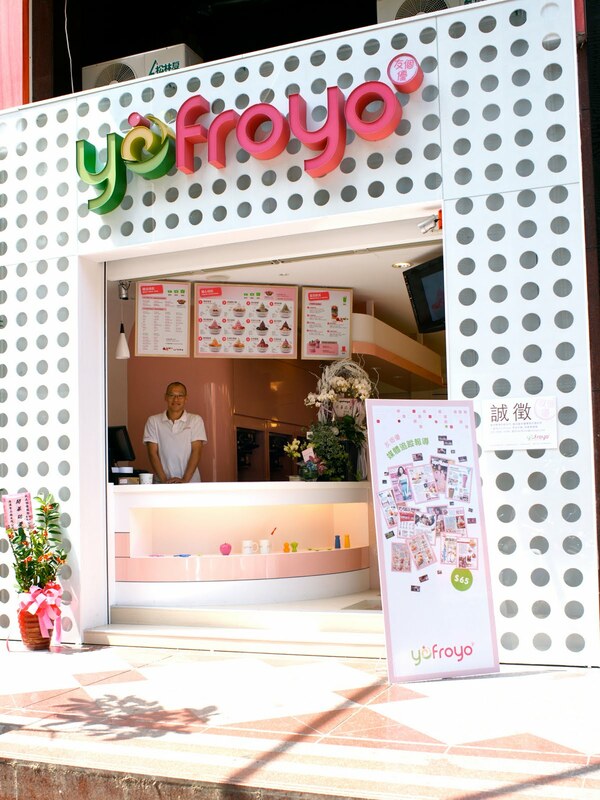 Wow, so many fro yo places popping up! I like how the green tea looks naturally green rather than artificially bright. Love that konjac is a topping! I wish konjac was a topping at the fro yo places around me. I like the design of the store -- light and refreshing! kirbie: i know! i like the flavor of green tea too- not too sweet or artificial at all and good matcha notes. Sporks! How interesting. I love to keep these froyo spoons. At my school there are plenty of people using Yogurtland spoons to eat lunch! 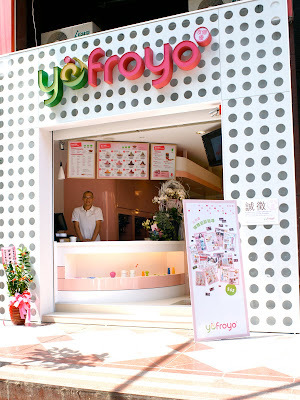 I find it interesting how YoFroyo looks like a ultramodern hide out among the older generation style of buildings. I would love konjac as a topping on froyo here! I had it last week and it was very tasty! I had the original with banana. Its menu reminded me of Cold Stone!